Dr. Jason E. Lane is the founding executive director of the SUNY Academic & Innovative Leadership (SAIL) Institute as well as Chair and Associate Professor of the Department of Educational Policy and Leadership at the State University of New York at Albany. He has extensive experience leading multi-campus transformational change initiatives in higher education and is a recognized expert in system thinking and development. An award winning author and invited speaker, Dr. Lane’s scholarly expertise focuses on the leadership and governance of higher education, particularly as it relates to the emerging relationship between higher education, policy and politics, and globalization. He has authored numerous journal articles, book chapters, and policy reports; and published 12 books, including Academic Leadership and Governance of Higher Education, Higher Education Systems 3.0, Multi-National Colleges and Universities: Leadership and Administration of International Branch Campuses, and Building a Smarter University. Previously, he served as Deputy Director for Research at the Nelson A. Rockefeller Institute of Government as well as Vice Provost for Academic Planning and Strategic Leadership and Senior Associate Vice Chancellor for the State University of New York, where he was responsible for the development and implementation of academic, economic, global, and leadership initiatives across the system. 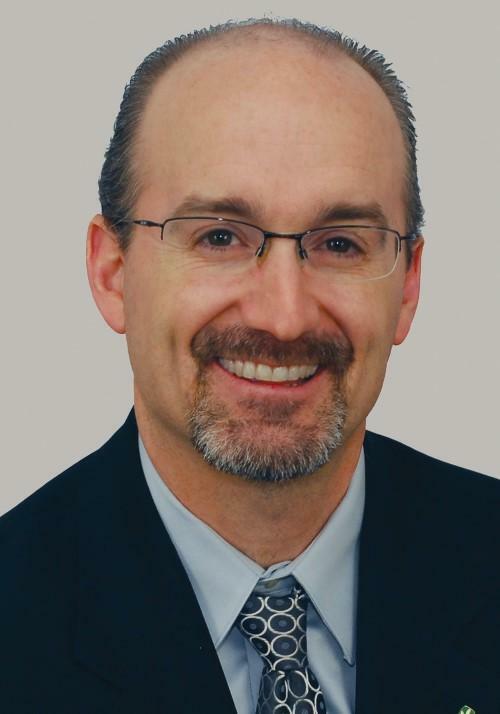 He is a founding faculty member of Penn State’s Academic Leadership Academy as well as System Leadership Academy sponsored by the American Council on Education and the National Association of System Heads. 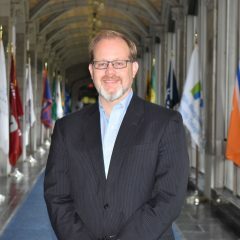 He has served on the boards of the Comparative and International Education Society (CIES); Council for International Higher Education (CIHE); the Gulf Comparative Education Society (GCES); SUNY Korea; and Taking Student Success to Scale (TS3), a consortium of 23 systems working to leverage evidenced based practices to improve student success. Carolyn Mattiske serves as the Associate Director of the SUNY Academic & Innovative Leadership (SAIL) Institute, which aims to support higher education leaders through programming and services throughout SUNY and beyond. Prior to this she worked at the Research Foundation for SUNY as their Learning and Development Manager. 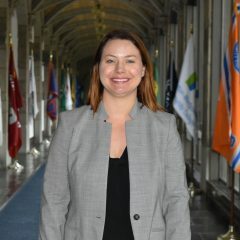 Carolyn has served as a stand-up trainer and curriculum developer for the University at Albany’s Professional Development Program (PDP) specializing in food stamp and welfare fraud detection policy. In her L&D role at the RF, she was responsible for managing the training needs throughout the 17,000 person organization. She collaborated with subject matter experts to assist with the development of training plans and determination of appropriate training delivery methods, tools and technology solutions. She managed Learning Tuesdays, a monthly 90-minute live streaming webinar training series, as well as an enterprise-wide mentoring program and leadership academy. Carolyn earned a bachelor’s degree in business administration with a concentration in marketing and minor in communications from the University at Albany. She earned a Master’s of Arts in Curriculum Development and Instructional Design also from the University at Albany in 2014. She currently serves as a board member and VP for Special Events for the Hudson-Mohawk Chapter of the Association for Talent Development. She is a busy working mom of two children, Owen and Evelyn. In her free time (Ha!) she enjoys skiing, practicing hot yoga, cooking and reading. President Ramsammy has more than 30 years of higher education experience, including senior academic and administrative positions at three of the largest multi-campus colleges in the United States. 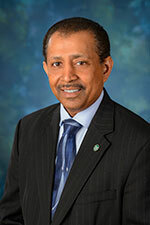 He is the former president of the West Campus of Miami Dade College and previously served as provost and chief academic officer at Northern Virginia Community College. Prior to that, at Palm Beach State College, he was professor of Microbiology and Anatomy and Physiology, chair of Biology, associate dean of STEM and dean of Academic Affairs. President Ramsammy has earned numerous awards for leadership, effective and inventive teaching, online instruction and academic program development, including the Virginia Governor’s Award for the most innovative STEM program; the Florida Association of Community Colleges and Palm Beach State College Professor of the Year awards; and the Adjunct Professor of the Year award at Broward College.He was awarded the Martin Luther King Jr. Cultural Foundation Outstanding Educator Award for his dedication to educational outreach for underserved populations. In addition, he was invited to participate in President Obama’s STEM Education College Opportunity Initiative and led Northern Virginia Community College’s contingent at White House meetings. President Ramsammy currently serves on the American Association of Community Colleges Commission Structured Pathways, and previously, he was a commissioner for Academic, Student and Community Development as well as Diversity, Inclusion and Equity. President Ramsammy is a first-generation college student who recognizes the extraordinary potential of education to change both individual lives and communities. Prior to a post-doctoral fellowship at Georgetown University’s Lombardi Cancer Center, he earned a Ph.D. in Molecular Biology and a master’s degree in Genetics from Howard University. He holds a bachelor’s degree in Biology from the University of the District of Columbia. He and his wife, Annette, have three children: Khalid, Josie and Shayda. Randall J. “Randy” VanWagoner, Ph.D., serves as the fifth president of Mohawk Valley Community College – a position he has held since July 1, 2007. He currently is serving his second term as chair of the New York Community Colleges Association of Presidents, a position he has held since 2015. Dr. VanWagoner came to MVCC after serving as the chief academic officer at Metropolitan Community College in Omaha, Nebraska and the chief student affairs officer at Red Rocks Community College in Golden, Colorado. He has been instrumental in the development of the national Strategic Horizons Network of community colleges and serves as the co-facilitator of the Network focused on learning about disruptive innovation and vibrant organizational cultures outside of higher education. He received his graduate degrees from the Higher Education program at the University of Michigan–Ann Arbor; his B.A. in communications from Oakland University in Rochester, Michigan; and was a two–sport athlete at Mott Community College in Flint, Michigan. He and his wife Jennifer live with their two daughters in New Hartford. Founded in 1946, MVCC was the first community college founded in the New York state. The College is known for the outstanding success of its students who transfer to a four–year institution, the talents of the graduates from the comprehensive array of career and technical programs, and its commitment to the continuing development of the dynamic community it serves. With over 25 years of professional experience in higher education, business operations, and non-profit management, MaryAnn Stark is known for being an inspiring leader with dynamic skills to teach and motivate other to follow in her passionate vision. 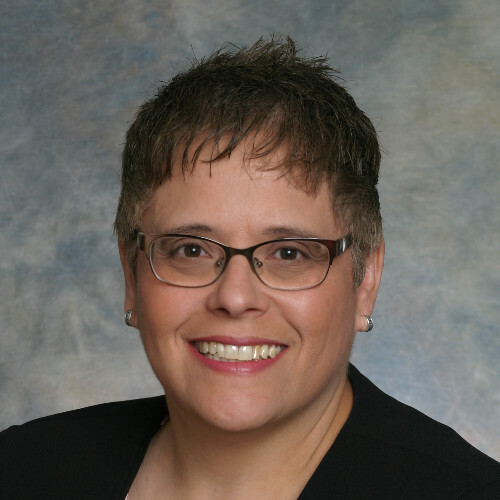 MaryAnn’s educational background includes a Bachelor of Arts from State University of New York at Oswego and a Masters of Educatiomn from St. Lawrence University. MaryAnn started her professional career in the field of Higher Education Administration serving at three different institutions for 12 years directing major student life, residential, and judicial programs. 1n 2001, MaryAnn made the move into the non-profit world where she was the President & CEO for nearly 12 years. Under her leadership, the agency experienced tremendous growth from being a local, then state-wide, and then nationally based organization, the 4th largest of its kind in the country that received two national awards for excellence. MaryAnn’s expertise lies in the areas of organizational development, business operations and management, and human services. She has made several contributions to her professional and civic community by way of regional and national conference presentations, outside consulting and training, and service on local Boards. MaryAnn is a gifted public speaker, and creator and facilitator of a wide variety of training programs specializing in leadership development, strategic planning, teambuilding, culture and organizational change. MaryAnn is a Certified Organizational Development Professional and a Certified EQ-12 and EQ360 Emotional Intelligence Practitioner. While serving the SUNY Leadership Institute, MaryAnn received rave reviews as the facilitator of the first ever Rising Stars leadership development program at SUNY Potsdam and SUNY Canton. 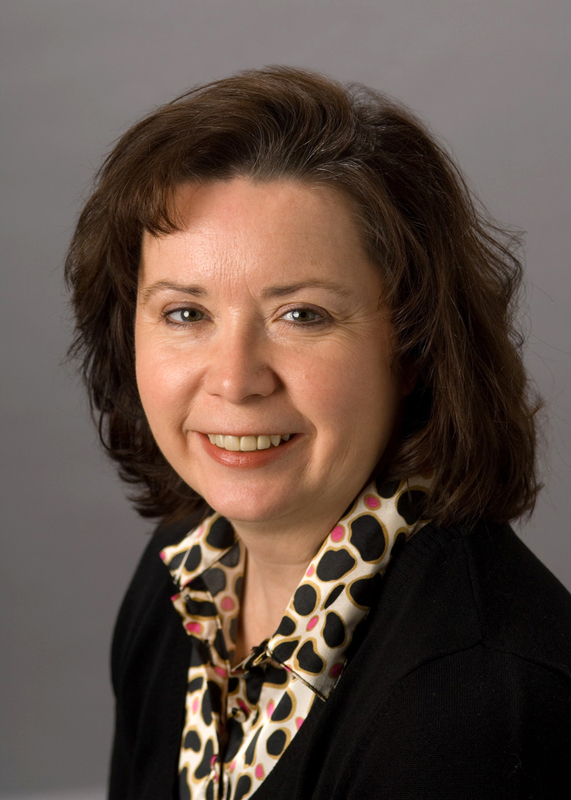 Mary Ellen Mallia is the Director of Sustainability at the University at Albany. Her office is in charge of coordinating sustainability activities related to curriculum, operations, research and engagement. Mary Ellen received her B.S. in Economics from Siena College, her M.A. in Education from the University at Albany, and her Ph.D. in Ecological Economics from Rensselaer Polytechnic Institute (RPI). After starting her career in financial management, Mary Ellen went on to teach economics at the high school and college level for over 15 years. Since becoming director in January of 2008, Mary Ellen has helped develop robust educational and engagement activities to complement the campus’ sustainable operation initiatives. Currently she serves on the steering committees of the New York Coalition for Sustainability in Higher Education (NYCSHE) and the Farm to Institution New York State (FINYS) group. Mary Ellen lives on a farm in Princetown, NY with her husband and daughter and a menagerie of animals. 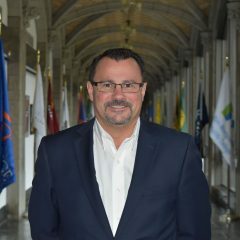 Glenn currently serves as the Director of the Office of Opportunity Programs at SUNY Oneonta where he provides leadership for the Educational Opportunity Program and the Access to College Excellence Program. Prior to working at SUNY Oneonta Glenn worked at Mercy College in Academic Advising and Opportunity Programs. Before working in higher education he worked in government serving as a Legislative Aide and Chief of Staff in the Suffolk County Legislature. Glenn earned a Master’s Degree in Public Policy from Stony Brook University and a Master’s Degree in Higher Education Administration from the University at Albany. He is currently pursuing a Doctoral Degree in Educational Policy and Leadership at the University at Albany. Glenn’s professional interests include leadership development, opportunity program management, academic support services, academic program development, diversity and inclusion and increasing student success for underserved populations. In his free time, he enjoys playing basketball, spending time with his wife and two dogs and being creative. Dr. Scott Vinciguerra is responsible for the development and delivery of leadership development programming for the SAIL Institute. A former educator and administrator in public and higher education, Dr. Vinciguerra brings over 20 years of experience leading people and organizations to exceed their potential. His presentations at local, state, national, and international conferences are hallmarked by his ability to engage with others through an authentic and transparent disposition. He has twice presented research at the internationally prestigious Learning & The Brain Conference, sponsored by the Dana Alliance for Brain Initiatives, and the Harvard University Faculty Club. The author of three books on leadership, he is a consultant to a multitude of organizations and businesses, as well as Olympic athletes in areas of mental preparation and peak performance.